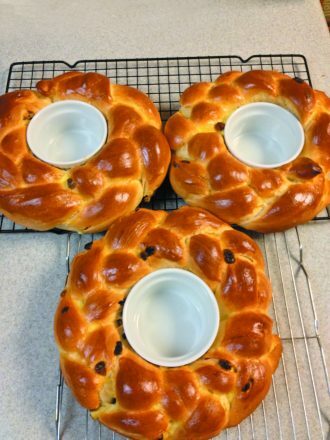 Marc Sussman makes these round, braided raisin challahs and puts ramekins in the middle for honey for Rosh Hashanah. Home-baked challah for Rosh Hashanah — and year-round. His wife, Dr. Mintzi Schramm, clarifies that he took up challah baking when he retired as a professor of linguistics and Semitics at the University of Michigan. That was 29 years ago. 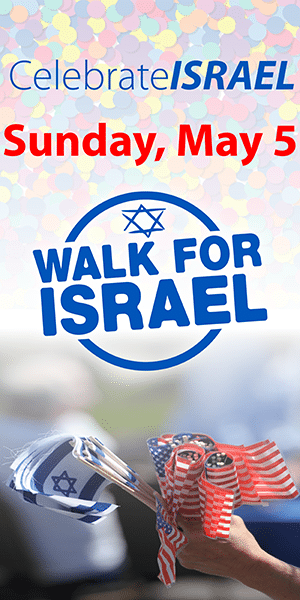 The Schramms live in Southfield and are longtime members of Young Israel of Oak Park. Gene Schramm measures flour for his challah. After experimenting with different recipes, Schramm settled on a favorite: his modification of the no-knead challah popularized by Jeff Hertzberg and Zoe François in their 2007 Artisan Bread in Five Minutes a Day. Schramm notes the book title is a bit of an exaggeration; it does take more than five minutes. Watching Schramm work in the kitchen is an education. He works slowly, systematically, meticulously, step-by-step with unhurried concentration. Baking seems a mental discipline, a sort of meditation. 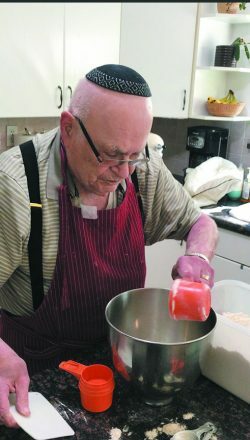 Schramm feels proud that one of his granddaughters, Nechama Werther of Denver, bakes challah using the same recipe. Marc Sussman of Huntington Woods makes a special fancy challah for Rosh Hashanah as well as for other occasions during the year. Sussman retired from work as an attorney specializing in Social Security disability cases. 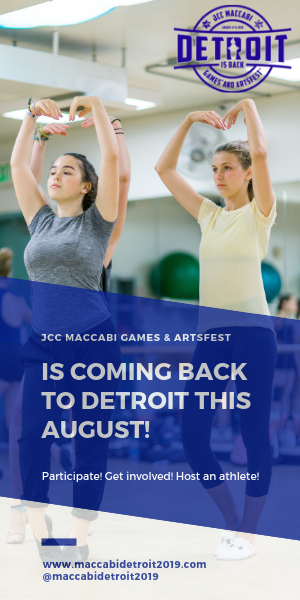 He and his wife, artist Lynne Avadenka, director of Signal-Return letterpress shop in the Eastern Market, have two sons, both chefs in Brooklyn, N.Y. Marc and Lynne live in Huntington Woods, and they belong to Congregation B’nai Moshe in West Bloomfield. 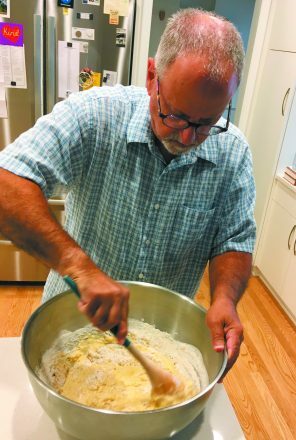 Marc Sussman mixes dry ingredients with the wet yeast mixture while making his challah dough. Sussman tells how he got started as a challah baker. That was 42 years ago, and she has not made challah since. He had learned to bake challah some time earlier. “You know,” he says, “there is a Jewish tradition to give credit to your teacher. B’nai Moshe had a service auction for some good cause, and I won — and paid for — instruction in challah baking from Pearlena Bodzin. I still use the recipe I got from Pearlena, but sometimes I embellish it in two ways. “For Yom Tov or for a secular holiday, I sometimes make the challah in a special shape. For Shavuot, the tablets; for Chanukah, a chanukiah; for Tu b’Shevat, a tree. Sussman says that sometimes baking challah feels like a chore. If he gets home late on Thursday night, starting the dough means that he will stay up late baking. However, he enjoys the hands-on, physical work and the creativity. Sussman and Schramm agree about one of the additional benefits of home-baked challah: It makes good French toast. Baruch attah Adonai Eloheinu melech haolam, asher kid’shanu b’mitzvotav v’tzivanu l’hafrish challah. Blessed are You, Adonai, ruler of the universe, who has sanctified us with Your commandments and commanded us to separate challah. 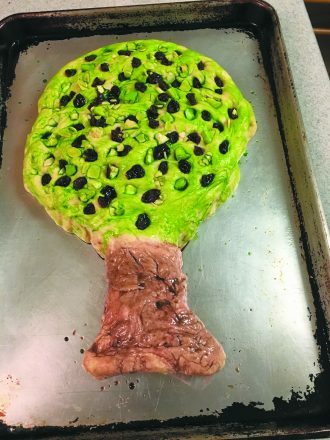 Sussman’s tree challah for Tu b’Shevat. In a small bowl or 2-cup measuring cup, mix together using a whisk or a fork. Let the mixture sit for about 10 minutes until there is a foamy head on it. Pour the foamy yeast mix into the big bowl and mix it all together. Add bread flour a cup at a time, mixing first with a wooden spoon. When it is too stiff for the spoon, add handfuls of flour, then knead by hand until about ¾ of a 5-pound bag of flour has been added. When the dough is no longer sticky, you have put in enough flour. Cover the dough with a towel and let the dough rise in a warm place for about two hours or more. If you have enough time, let it rise overnight at room temperature. Take challah (a piece of dough about the size of a walnut), say the blessing, put the little piece of dough onto a piece of aluminum foil, and burn it under a broiler and dispose of it. Preheat oven to 400 degrees. Form loaves, adding whatever ingredients you choose and put them into the oven, in well-oiled pans or on a well-oiled baking sheet or on parchment paper. Reduce heat to 350° after 10 minutes. Check the loaves frequently, moving them in the oven to bake evenly. Brush loaves with a mixture of one egg and 2 tablespoons of water after about 25 minutes, sprinkle immediately with poppy or sesame seeds. Remove loaves when they have browned, about 40 minutes. Put onto a wire rack to cool. If baked in loaf pans, remove loaves from pans after they have cooled. Learn how to braid challah in these video tutorials! 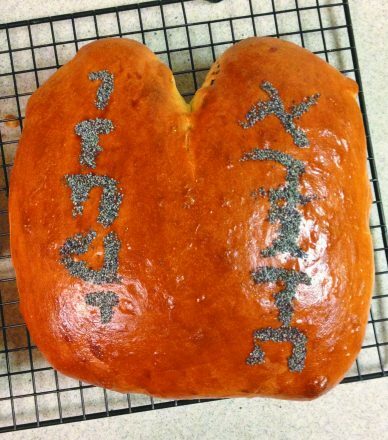 Sussman’s Shavuot challah in the shape of the Ten Commandments tablets. Add the liquids and mix with a paddle until the flour is totally combined. (The mix should resemble a mass of cold cooked oatmeal). Transfer the dough to a lightly oiled container and allow to rise for approximately 2 hours, until the dough is doubled and flattened on top. Cover the container loosely and refrigerate the dough for three hours or overnight. Transfer the dough to a lightly floured board and divide the mass of dough into six parts. Shape each piece into cylinders approximately ¾ of an inch thick. Fold each cylinder over into a loaf shape. Sprinkle with sesame or poppy seeds. Glaze each loaf with an egg wash (or use Eggbeaters) and allow to dry. Glaze again. Place each loaf in a lightly greased loaf pan. 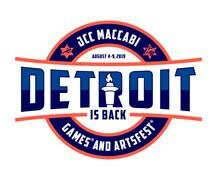 Heat oven to 425 degrees for water challah or 325 degees for egg challah. Bake the bread for 30 to 35 minutes.